On this page you will find a range of women, peace and security resources, both those developed by the Coalition or our members, including a number of issue briefs, as well as external resources and key women, peace and security resolutions and reports. To date, the United Nations Security Council has adopted nine resolutions on “Women, Peace and Security,” together they make up the WPS Agenda. UNSCR 1325, is the historic first resolution that confirmed the global commitment to women’s full involvement in peace and security. More than a resolution, it serves as a political framework that confirms the importance of gender perspective in negotiating peace, peacekeeping, and response to conflict. The subsequent eight resolutions build on this historic framework, you can find their summaries below. UNSCR 1325 (2000) Acknowledges the distinctive quality of women’s experiences in conflict and recognises the role they play in peace and security. UNSCR 1820 (2008) First UNSCR to recognise sexual violence as a tactic and weapon of war. 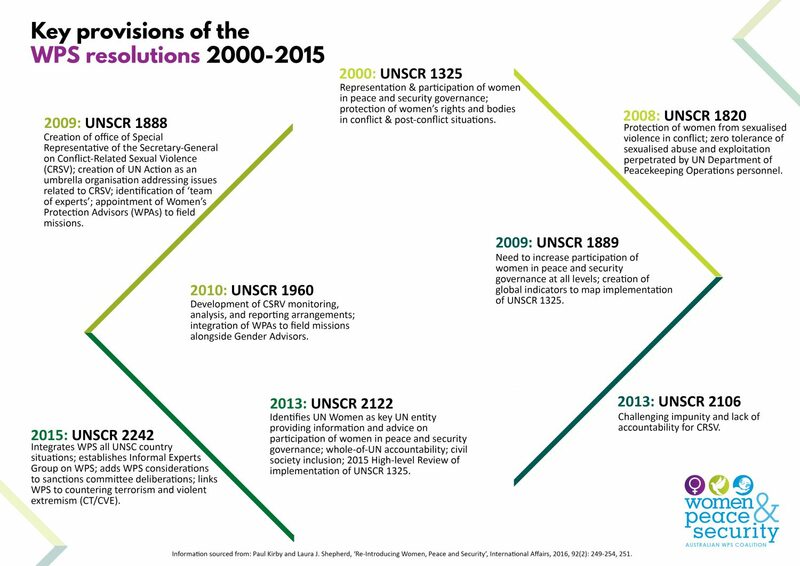 UNSCR 1888 (2009) Re-iterates the severity of sexual violence and strengthens the mechanisms and tools used to implement UNSCR 1820 by appointing special representatives for sexual violence in conflict. UNSCR 1960 (2010) Confirms the importance of ending conflict-related sexual violence by creating accountability systems which encourages increased monitoring, analysis, and reporting. UNSCR 2106 (2013) Addresses operational concerns and provides guidelines to combat sexual violence and impunity. UNSCR 2122 (2013) Urges all parties to take stronger measures to facilitate equal, full and meaningful participation of women in conflict resolution and recovery. UNSCR 2242 (2015) Refocuses the WPS agenda set out by UNSCR 1325 by addressing implementation hurdles of gender mainstreaming in the UN system. UNSCR 2272 (2016) Supplies guidelines for managing sexual abuse and exploitation in peacekeeping operations. Visit Security Council Report’s website for other UN documents on women peace and security. The report of a global year-long study on the implementation of UNSCR1325 managed and coordinated by UN Women. The study highlights good practice, implementation gaps, challenges to the WPS Agenda, emerging trends, and priorities for action. The study reaffirms that the prevention of conflict must be the global priority, not the use of force, and holds that women’s participation is key to sustainable peace. Coalition Members Anu Mundkur and ACFID hosted a webinar on Women Peace and Security. This foundational webinar looks at what we mean by gendered impact of conflict, the emergence of the women peace and security agenda and its importance. It explains that to achieve sustainable peace and security we need reforms to existing systems that perpetuate conflict. Now extended to mid-2019, the Australian National Action Plan on Women, Peace and Security sets the Australian Government’s domestic and international strategy to integrate a gender perspective in its peace and security efforts in the listed timeframe. Priorities include: protecting the rights of women and girls, promoting women’s participation in peacebuilding/keeping and conflict resolution, and supporting civil society groups who promote women’s leadership in peace processes. Created by the Georgetown Institute for Women, Peace and Security in conjunction with the Peace Research Institute of Oslo the index is a major innovation that, for the first time, compiles international data to rank 153 countries on peace, security, women’s inclusion and justice. The report will be updated every two years, and will provide greater insight on women’s economic, social, and political inclusion; women’s access to formal justice in retaliation to informal discrimination; and the family, community, and societal aspects of women’s security. Read WPS Coalition members, Anu Mundkur and Laura Shepherd’s, reflections on the index in How (not) to make WPS count. The 2030 Agenda for Sustainable Development’s commitment to gender equality is prominent, comprehensive and cross-cutting, building on the commitments and norms contained in the Beijing Declaration and Platform for Action and the Convention on the Elimination of All Forms of Discrimination against Women (CEDAW). This report makes clear that women play a vital role in preventing conflict and maintain peace thus making gender equality a driver of sustainable development. The International Women’s Development Agency (IWDA) is the leading Australian agency entirely focussed on women’s rights and gender equality in the Asia Pacific region, and is a member of the Civil Society Coalition for Women, Peace and Security. Within this policy brief, IWDA provides justification for linking the WPS Agenda to the 2030 Agenda for Sustainable Development, and calls on the Australian government to adopt an approach to the SDGs which places women, peace and security at the centre of its efforts. National Action Plans (NAPs) are strategies created by each state to implement UNSCR 1325 and subsequent WPS Agenda resolutions. Our Secure Future has created an interactive map that reflects the status of state commitments to the WPS Agenda. The Map includes information on NAP development, revision, civil society and government organisations engaged in NAP creation and implementation, and country rankings on the WPS and Global Peace Indexes. This report provides an introductory overview of the Women, Peace and Security Agenda, its background and history, key international instruments and its relevance and implications for Australia. This resource aims to give people who are new the the WPS movement an overview of what it is, why it is important, where it fits in the international structure of conventions, resolutions and other agreements for upholding women’s rights in conflict.